Recognized masterpieces of Indian literature, the Guru Granth Sahib and the Dasam Granth are fundamental to the Sikh religion, not only in the physical layout of temples and in ceremonies of worship, but as infallible reference texts offering counsel and instruction. 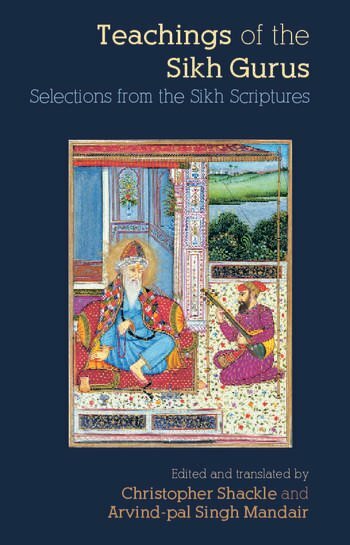 Teachings of the Sikh Gurus presents a brand new selection of key passages from these sacred scriptures, translated into modern English by leading experts, Christopher Shackle and Arvind-pal Singh Mandair. Including six longer compositions and many shorter hymns thematically organised by topics such as Time and Impermanence, Self and Mind, Authority, and Ethics, the book’s accessible and carefully chosen extracts distil the essence of Sikhism’s remarkable textual and intellectual legacy, depicting how its message of universal tolerance suits the contemporary world. The detailed introduction and notes to the translations aid readers’ comprehension of the hymns’ form and content, as well as providing some historical context, making it an ideal introduction to Sikh literature.